A "Personal Certificate" issued by any Certificate Authority (CA). A private key which corresponds to this certificate. One, zero or more "Root Certificates". User authentication in L2TP/IPsec VPNs (more info). Web client authentication in Pocket Internet Explorer (SSL, HTTPS) (more info). User authentication in 802.1x wireless networks (EAP-TLS only) (more info). Exchange ActiveSync certificate-based authentication (more info). Microsoft Office Communicator Mobile Client (more info). Sending and receiving encrypted e-mail (S/MIME) (more info). Other third-party applications that happen to support personal certificates. I have made three programs, but I recommend P12imprt over the other two. It is the easiest to use and it runs on Pocket PC 2003, Windows Mobile 5.0 and Windows Mobile 6. It is a bit larger than the other programs but after you have installed your personal certificate you can simply delete the executable or move it to your Storage Card (flash memory). In my opinion P12imprt has its advantages over the other programs. PPCCertImport by Kiko Vives Aragonés and Antonia Saez Bernal is similar to Crtimprt, only it is not based on Microsoft source code and it has a BSD-style licence. 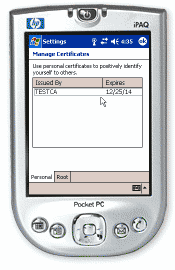 I have not yet tried the certificate enrolment in Vista Mobile Device Center. Apparently it requires Exchange server which increases the cost of ownership. (Sorry, I am not good at inventing names for programs. All my three programs basically do the same thing and I came up with equivalent names :-). The "Enroll" program or the enrolment client included with the MSFP update. The "Messaging and Security Feature Pack for Windows Mobile 5.0" (MSFP) is an AKU2 update for (some) Windows Mobile 5.0 devices. More recent devices ship with this update on board. The MSFP update add support for S/MIME and it includes a web enrolment client which allows the Windows Mobile 5.0 device to enrol for a personal certificate using an Desktop ActiveSync connection to a PC. However, I have not been able to get this working. There is some documentation but the setup is finicky and difficult to troubleshoot. ActiveSync 4.5 has a new "Get Device Certificates" menu option. It works only with Windows Mobile 6 devices. The menu option remains ghosted with other devices. A third-party program called PKI Companion by winlinx is available. I don't have much information on it. They have not responded to my repeated attempts to contact them, so I assume they are no longer interested in offering their product on the market. The author of this document is Jacco de Leeuw (contact me). Corrections, additions, extra information etc. are much appreciated.